Ideas can often strike at the most unexpected times, and from the most unusual places. In this case, I was inspired to build after digging through the Lego bins and coming across these lion head accent pieces that I had yet to use in any of my MOCs. My first thought was to use them for sort of statue, but after a few designs that I was completely displeased with, I changed gears and started to rethink my build. It wasn’t long after that I came up with the idea for an old doorway, and the rest just fell into place. The doorway itself is made using a simple SNOT technique with brown tiles creating that familiar indented door pattern. Adding the golden handles really accents the brown colour and adds a certain elegance to the build. After creating and mounting the doorway, the rest of the build was a breeze to complete, just using 1×2 grey tiles to create a stone texture. I was also quite pleased to see that the lion heads fit in without being disproportionate to the rest of the build, since I created my own, larger scale doorway as opposed to using the standard 1x4x6 doorways. 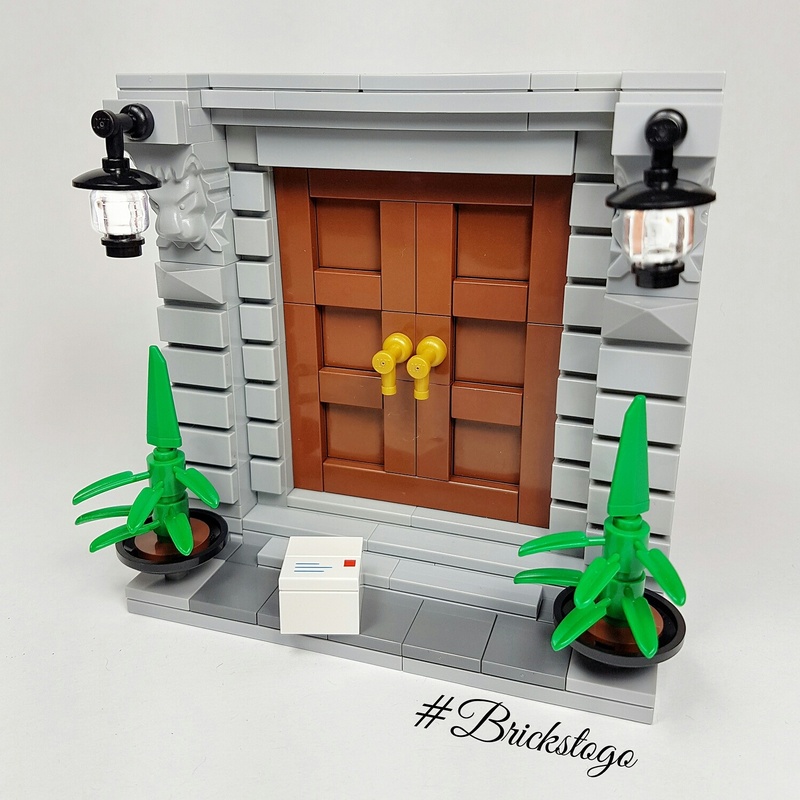 As a last minute addition to the build, I added a small package in front to add a sense of realism to the MOC, to reinforce the idea that there is actually someone living behind the doorway. This small MOC was fun to build and is easy to re-create for your own projects.